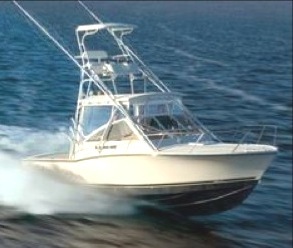 This 28ft Carolina Classic out of Tamarindo is powered by twin 4BTA Cummins turbo diesels. Captain Pit Kriedel is at the helm, assisted by mate Rudy. She has a full cabin with head, padded gunwales, Furuno depth sounder, Lee outriggers, bait well, gimbaled fighting launcher, and an Aftco stand-up harness. She sports Crowder custom 50lb rods with Shimano Tiagra 50 reels, Crowder custom 30lb rods with Shimano Tyrnos 30 reels and Penn spinning tackle, along with two Furuno GPS, three VHF radios, anchor and ground tackle, and all the required safety equipment.